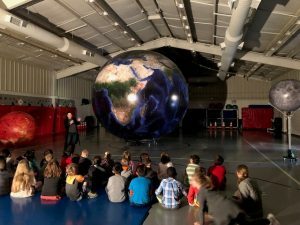 ATLANTA, GEORGIA – Oak Grove Elementary, a STEM certified school, hosted both the Big Canyon Balloon and Orbit Earth Expo for their students this week. Rocky the Big Canyon Balloon arrived on Tuesday with his sidekick teachers, Bailey and Amy. 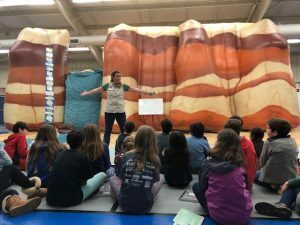 1st, 3rd, 4th, and 5th grades had a blast sorting out what in the world happened to the waterfall as we time traveled thousands of years into the future! Was it weathering? Was it erosion? Do you remember how to tell the difference? There were some rock star dancers that helped us with the Erosion Dance…no one can forget that! 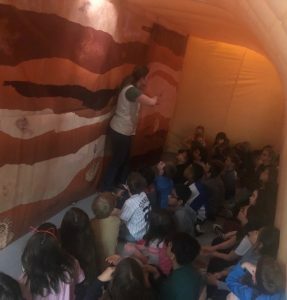 A visit to the fossil tunnel to go back in time finished up our day – the cephalopod and trilobite fossils helped us tell the story of the rock layers. Where do you find the oldest rock layers? At the bottom, of course, because they were there first! 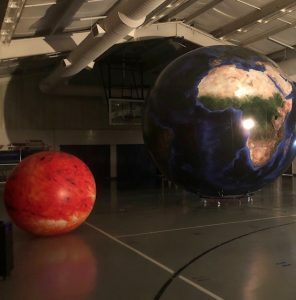 Wednesday morning SparkPoint Innovations returned to Oak Grove with their other partner in science, Orb, our 14′ earth model featured in Orbit Earth Expo. Stephanie and Gabi spent the day with the Pre-K, kindergarten, 2nd and 4th grades exploring the patterns in our solar system. Rotation and revolution? No problem for this crowd! A 2nd grader walked in the door and immediately saw the problem with our sun – “That’s not supposed to be the sun, is it? It’s way too small!” Well, that second grade was totally right. Why can’t we bring the right size sun for a 14′ earth? And what was the right size earth for our Sun? A marble! Made you feel kind of small, didn’t it? We finished up with 4th grades and solved the mysteries of seasons and tides, winds and the solar system. Thanks for two fantastic days, Oak Grove! Your students are science rock stars! Dekalb County Schools is the place to be for STEM!